Kevin is a recent graduate from Journalism with French. He was involved with the SU from his first week at UU, becoming a course rep and then a volunteer in various roles. Before becoming President, he was VP Coleraine for a year. This is Kevin’s second term as President. Being President of one of the biggest Students’ Unions in the UK and Ireland is a varied and busy role. 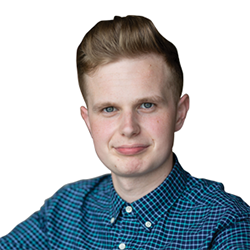 Kevin is the lead Officer representing the student voice to the University, and to our local and national politicians to influence a wide range of issues which affect our members. The President is also the Chair of the UUSU Trustee Board – our governing body – which makes sure the whole organisation fulfils our strategic plan, delivering all services for our students within our budgets! 3. Improved students’ union and socialising spaces on each campus – giving students better areas to relax, socialise or study!